The regulatory reform and economic turbulence of recent years have put a tight squeeze on the profitability of financial institutions. In response, bankers know they need to cut costs and reduce charge-offs. They also need to unlock new revenue opportunities through keener insights into customers and new applicants. How can financial institutions achieve these goals in a hotly competitive market? 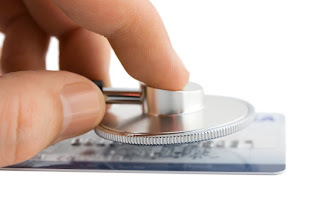 How can you make more profitable decisions at the point-of-sale while reducing risk and fraud? One innovative way to build revenue from new customer segments, improve risk assessments and reduce charge-offs is using alternative data to know your customers better—especially customers with thin files or limited credit histories. Alternative data can include payment histories of mobile phone accounts, utility bills, apartment rental detail and even payday loans. Every financial institution wants to identify and capture profitable households, and demand deposit accounts (DDAs) are the primary gateway for establishing a consumer relationship. However, the traditional consumer risk assessment tools most institutions use at account opening are not effective with the “unbanked” and “underbanked” population. These tools can be enhanced with relevant payment data. Alternative data adds new dimensions to a financial institution’s ability to evaluate consumer risk. Using the non-traditional, trade-line data delivers incremental decisioning power to generic risk models based on credit files alone. Traditional credit file attributes provide only a partial picture of a consumer’s monthly financial obligations. The picture is much more complete when bankers can see consumer payment behavior with rent, cable, phone, water, gas or electric bills. Banks struggle not only with assessing risk on deposit accounts, but also with awarding credit to consumers with little or no credit history. Understanding the payment behavior of consumers, particularly payments not on the traditional credit file, is the key to unlocking lifetime profitability. Some alternative payment information can also provide a more complete trade-line view of consumer behavior over time, which enables powerful analytic applications that can be applied beyond the population of unbanked and underbanked consumers. For example, in the case of a customer attempting to rebuild credit, alternative data can provide tremendous insight. Using their conventional risk assessments, the banks experienced a charge-off rate of 9.3 percent of approved accounts, with an average charge-off amount of $300. 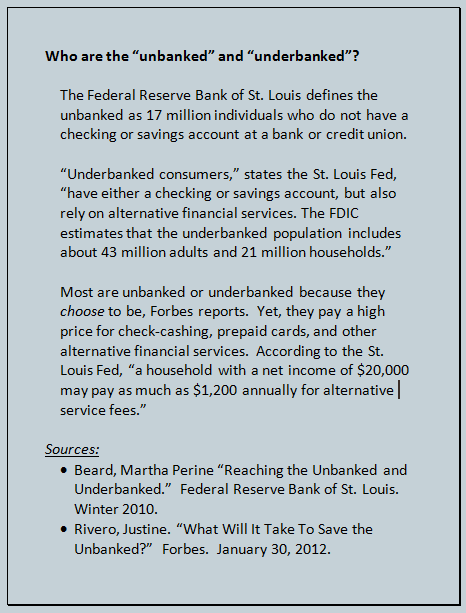 Had the banks used alternative data as an incremental determinant in account screening, they would have identified 40% of charge-off accounts and 39% of charge-off amounts in the bottom decile. Start by estimating the market size. 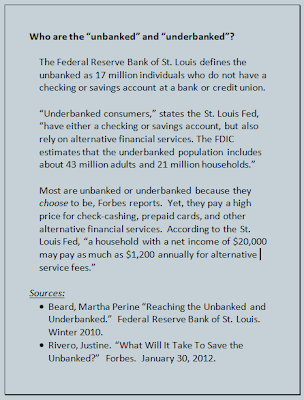 At joinbankon.org, you can download estimates of the number of unbanked and underbanked households in your area. Next, select a reliable source for alternative data. With alternative data, you can confidentially make low-risk point-of-sale offers and expand your reach by securely tapping into the largely underserved thin-file, no-file consumer segments. And, by having a better, more comprehensive view of consumer risk and opportunity, you will be better equipped than your competitor’s to grow your primary household portfolio. This post was contributed by: Brad Jones.